Are you looking for some exciting and thrilling activities in Sabah? If you are, make sure you do not miss out the Padas River White Water Rafting to indulge yourself in one of the most happening and thrilling water sports you can ever find in Sabah! In here, you will be able to try out one of the most happening rafting activities which will definitely make your trip to the place worthy and meaningful. 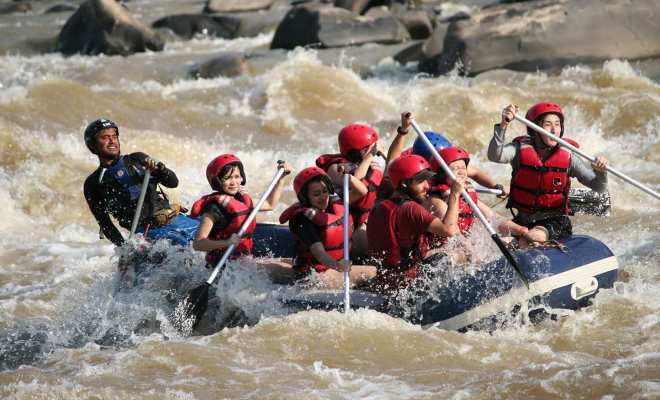 There are many types of rafting adventures to choose from in the Padas River White Water Rafting, ranging from adventures with names such as Scooby-Doo to Merry Go Round. However, although the names do not sound thrilling and adventurous, do not underestimate the challenge they can propose to you. If you are an adventure seeker by nature, you would find these rafting activities up to or even exceeding your expectations; if you are a newbie or a beginner with such rapid activities, be sure to hold tight to your seat belts (or paddles, in this case) because you are going to experience something remarkable which you might not have a second chance to experience it again in the future. However, you do not need to worry that you might not be able to cope up with this activity because of the difficulties and unimaginable challenges possessed by these activities. There are many types of challenges which you can choose from and thus, this allows you to choose the activity base on your own preference and ability. Of course, there will be life guards on standby at all times, along with safety equipments to ensure that no unwanted casualties will occur during the conduct of the rafting activities. You might be surprised to know that the rafting adventure will be one of the longest adventures you will experience in Sabah, as the route measures up to 30 kilometers, making it the longest route in Sabah. After a thrilling adventure down the stream, you can tour around the place while enjoying the peace of the nature with the green trees surrounding the stream. You would also be constantly hearing birds chirping, as if they are welcoming you to the place. Before you leave the place, be sure to take picture of yourself with your life jacket and safety helmet on as a remembrance of the place and of course, to jot down the memories which you had successfully conquered one of the longest stream in Sabah. From city’s heritage exploration to islands escape, accommodation option in KK is countless. For visitors looking to discover mother nature and access to the highest mountain in South East Asia. Gateway to the islands paradise (Mabul Island, Sipadan Island, Kapalai Island and more! ).